FQB "Farmhouse" Collection is a fantastic digital kit which is so versatile that you will be able to use it for couples, anniversaries, home photos and cards and so much more! You will love the vintage and modern mix of elements that make up this creative digital kit! 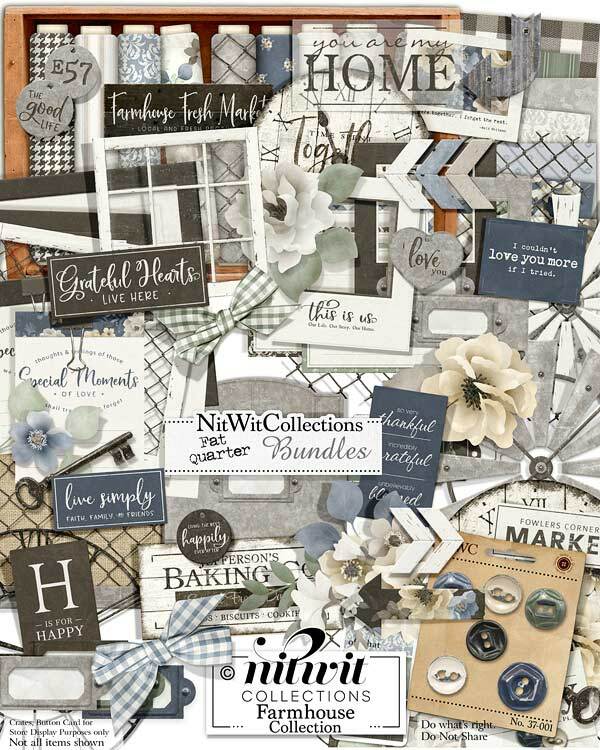 The weathered painted clocks and sign labels, the frames that you can use for photos or place the kit's labels in them and the old windows and chicken wire elements will give your digital scrapbook layouts and cards such unique interest and charm. Let your eyes wander through the papers and embellishments and we are sure that you will see not one project, but perhaps two or three that you will want create immediately! 1 Arrow element in the bold black and floral...how lush! 1 Chicken wire frame....the perfect idea board to place on the label signs from this kit! 1 Corner cluster of several of the elements in this creative kit! A fabulous main element to begin your layout or card with! 1 Frame with matting inside....who can resist adding a photo and printing this out?? 1 Frame - "This is Us...."
1 Frame in the black cardstock....why not add one of the label signs from this kit behind it for stunning results! 1 Old skeleton key...unlocking your creativity yet?? 1 Label sign - "Grateful Hearts...."
1 Label sign - "Fowlers Corners Market"
1 Label sign - "I Couldn't Love You More..."
1 Label - "We were together..." A terrific way to use a frame from this kit and a background paper....ideas we hope you'll use and create for yourself in your scrapbook layouts, cards and mini albums!! 1 Label sign - "H is for Happy"
1 Label sign - "So very Thankful...."
1 Metal pocket container back....what elements will you put in this pocket?? 1 Metal tag - "E57"
1 Metal tag - "The Good Life"
1 Metal tag - "I Love You"
1 Black metal tag - "Living the best...."
1 Digital stamp sentiment - "You are my Home"
3 Windmill wheel elements that we are sure will give your scrapbook layouts, mini album and cards a "whirl"! 1 Weathered wood sign - "Jefferson's Baking Company...."
1 Weathered wood sign - "Farmhouse Fresh Market...."